THE manufacture of airliners may be the world’s most globalised industry. Only two firms make big civil jets: Boeing of America and Airbus of Europe. Most of their revenues—55% for Boeing and 70% for Airbus—are earned outside their home territory. Both source parts from dozens of countries. But a ruling by the World Trade Organisation (WTO) on subsidies in the industry could deal another blow to the beleaguered international trading system. On May 15th the WTO’s final appeals body upheld parts of a previous ruling, finding that the European Union wrongly provided subsidies to Airbus to develop new aircraft. That, it concluded, had hit sales of Boeing’s jets. As soon as the WTO gives the go-ahead America will have the right to impose retaliatory tariffs on EU imports. Trade experts warn they could be the highest in the WTO’s history. Boeing crowed that the ruling showed that the EU had given $22bn in “illegal subsidies” to Airbus. But Tom Enders, Airbus’s chief executive, described it as “half the story”, pointing to another WTO ruling due later this year on $11.7bn of tax breaks from Washington state for Boeing’s 787 and 777X jets. Both are half-truths, says Scott Hamilton of Leeham Company, a consultancy in Seattle. Airbus’s counter-case may not be as strong as it claims. And the WTO upheld only 14 of Boeing’s original 234 claims against Airbus, with the ruling relating to just $9bn of its claim of $22bn. In the past, a ruling like this would not have threatened the rules-based trading system, says Chad Bown of the Peterson Institute for International Economics, a think-tank in Washington, DC. Until Donald Trump came on the scene, the heat had gone out of the Boeing-Airbus dispute. The administrations in Brussels and Washington had hoped that a ruling would prompt the two plane-makers to stop attacking each other and agree on which subsidies they would both find acceptable. And when retaliatory tariffs were imposed after previous WTO rulings, for example against America’s steel duties in 2002, they were carefully aimed at politically sensitive industries, such as Florida oranges, to force the other side to concede quickly. That may not happen this time. Mr Trump’s trade representative, Robert Lighthizer, has threatened to use “every available tool”, including “countermeasures on EU products”. But rather than taking a nuanced approach, the administration may impose tariffs on imports of European cars, which Mr Trump says are taxed less than American ones exported to the EU. Europe might then use any ruling in Airbus’s favour to retaliate against Mr Trump’s proposed steel and aluminium tariffs. Rather than the two sides reverting to free trade, the row could escalate. When Boeing first brought the case in 2004, it hoped for a quick resolution. 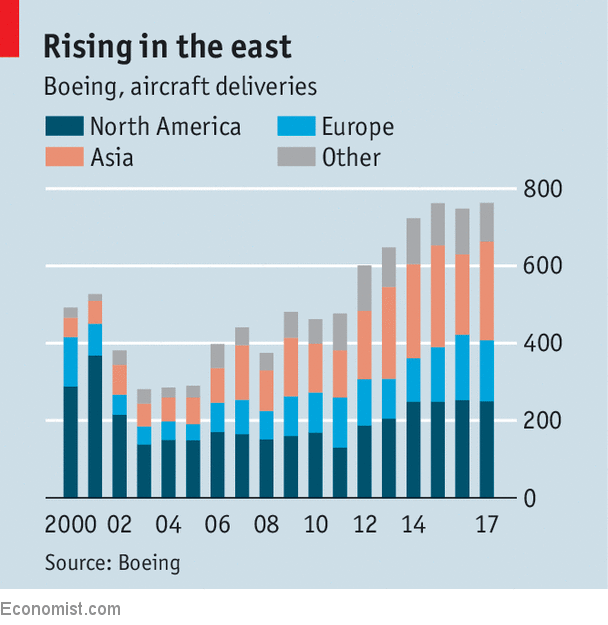 It was worried about the growth of Airbus’s market share from 18% to 50% in the 1990s, explains Adam Pilarski of Avitas, a consultancy, and feared that an EU-funded rival to its new 787 jet might force it out of business. But it has held onto market share since then. The 787 has sold far more than Airbus’s rival A350. And Boeing’s share of sales outside North America has increased sharply since the early 2000s (see chart). That means free trade is now in Boeing’s interests, says Richard Aboulafia of the Teal Group, a research firm. In December Canada cancelled an order for over $5bn of Boeing’s fighter jets in retaliation for its failed attempt to get tariffs of nearly 300% put on imports of airliners made by Bombardier. When it comes to tariffs, Boeing should be careful what it wishes for.